The restaurant Joe Beef in Montreal is the one that came up with the foie gras Double Down a few years back. They didn’t come up with that dish to be ironic or as some sort of statement on gastronomy. They did it because they think it’d be friggin’ delicious. Dining at Joe Beef was one of the most magical experiences of my life. There are no norms, no artifice, no vying for Instagram attention. The chefs and figureheads, David McMillan and Fred Morin, seems to have but one goal for customers: Pack as much deliciously dense properties onto a plate as physically possible, at all cost. The duo’s second cookbook, Joe Beef: Surviving the Apocalypse is a fever dream of a tome, with an end-of-the-world theme and recipes intended to help you survive the Zombie Hereafter (recipes like beef jerky, spruce cough drops, pickled deer necks). There are also recipes for the present—the precious few moments we have remaining in this mortal world—and as is customary of the Joe Beef hive mind, the dishes run the gamut from classic to far out, and all sound wildly delicious. How about duck stroganoff? Burnt-end bourguignon? Marrow pilaf? The one recipe that caught my eye appeared on page 60: Chips “All-Dressed” Butter. Have you had all-dressed chips? They’re ubiquitous in Canada, a country with a far advanced potato chip culture than the U.S. All-dressed chips are essentially every chip seasoning jumbled into one savory-and-tangy flavor (sour cream and onion + salt & vinegar + barbecue + ketchup). It’s available in the United States—Zapp’s dubbed theirs Voodoo flavor, and it’s fantastic. The Joe Beef recipe has you taking all-dressed chips, whazzing them up in a food processor into crumbs, then integrating into butter and making essentially a potato chip compound butter. 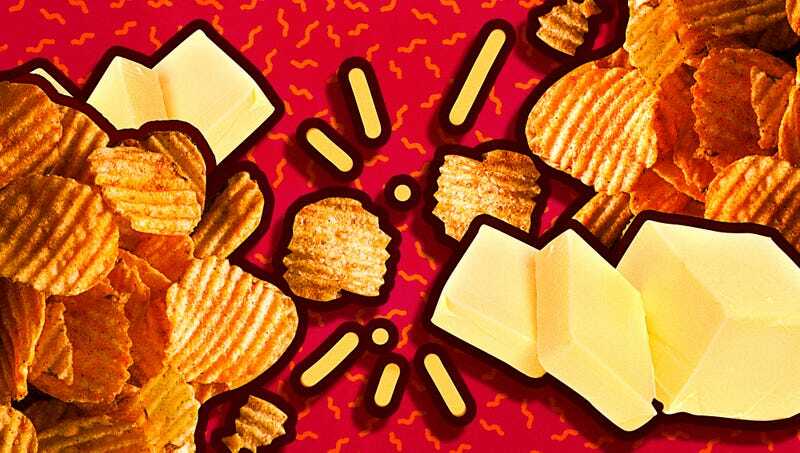 When I spoke with David McMillan, he told The Takeout it makes sense: Perhaps the most enjoyable part of the potato chip-snacking experience is dumping the powder at the bottom of the bag directly into your mouth. I was sold. I whipped up a batch of all-dressed chips butter and spooned it on top of seared scallops. Holy moly. I imagine serving this at a fancy bistro, telling customers I took potatoes fried in butter, then dehydrated into a powder, then combined with various herbs and spices, then turned it into a buttery pan sauce. I could make it sound super fancy. Or I could just say I made potato chip butter. And that it took me about five minutes to make. Pulverize chips to a fine crumb in a food processor. Add room temperature butter to a bowl and dump in chip crumbs. Add salt and hot sauce. Mix until combined. At this point you can either use as is, or roll into a log between parchment paper and chill in the fridge, which you can then slice. Will keep in fridge for one week, or in a freezer for up to two months.